Lately, I've been thinking about some fun things that my kids and I can do over the holidays. Things that will reinforce the basics of our faith yet not seem to much like school or catechism class. I've been toying with the idea of learning more about the 12 Days of Christmas song. I've compiled some resources and activity ideas on my homeschool blog, Guiding Masha. If you are also looking for "12 Day" theme activities, please skip over to the blog and check it out here. Looking for memorable ways to celebrate Advent and Christmas? 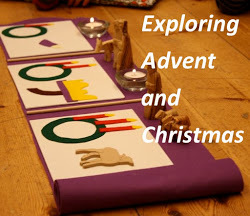 Check out Sheila's "Exploring Advent and Christmas" link party at her Explore and Express blog. Cheryl, I have wanted to do more with the 12 days as well so I will have to check this out more when I go to plan it. Thank you! For sure I am extending our Jesse Tree to include the 12 days. By the way, I've nominated you for Liebster blog award - really a getting to know you kind of post but it was fun to do and I would love to see you do it too so I can know more about you. Thanks for your comments and nomination, Nicole! Would love to hear about it if you do some sort of "12 days" study. I'm hoping that I can hone it a bit more and come up with something that becomes a tradition in our home.